Блекджек – game rules. Gameplay – see how to play Блекджек on GameDesire! The game is started by a virtual dealer who shuffles the deck and shows it to the table. 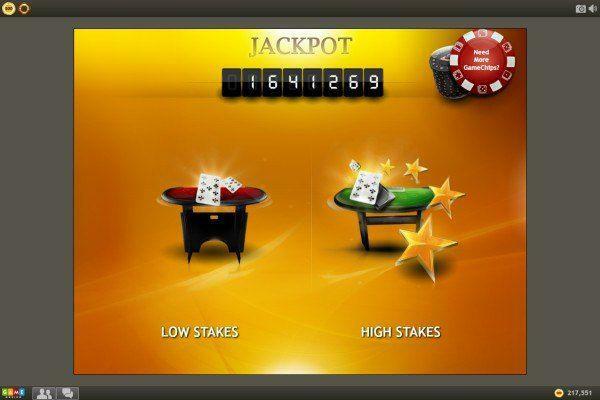 At this point, players may join the game by placing their initial bet. In lower stakes games, the minimum bet is 100 with a maximum of 2,500. On higher stakes tables, the minimum is 1,000 and maximum is 25,000. Players can decide on how many positions at the table they would like to play (one, two or three) by simply clicking the “Click to Play” circle(s) on the table. After selecting the numbers of positions they wish to play and placing their initial bet, push the purple “DEAL!” button. The virtual dealer will now deal the cards, two for himself (one face down) and two for every position being played at the table. The next step is to decide whether to stand (play only the cards you were dealt) or hit (receive another card from the deck). If the player chooses to hit (by pressing the green “HIT” button) and takes another card(s), dealer's hidden card will remain face down until the player is satisfied with their hand and presses the green “STAND” button, reaches 21 or busts. The winner is the one who attains the sum of 21 or closest. In the case of a player and the dealer holding an equal number, it is called a “push.” In this event, the player retains their initial bet but does not win any extra chips. If either a player's or dealer's cards total higher than 21, they “bust” and therefore automatically lose. If a player is dealt a blackjack, the dealer pays off GameChips in relation 3 to 2. Insurance – after the dealer has dealt the cards, if one of the dealer's cards is revealed to be an ace, then there is the option of insurance. 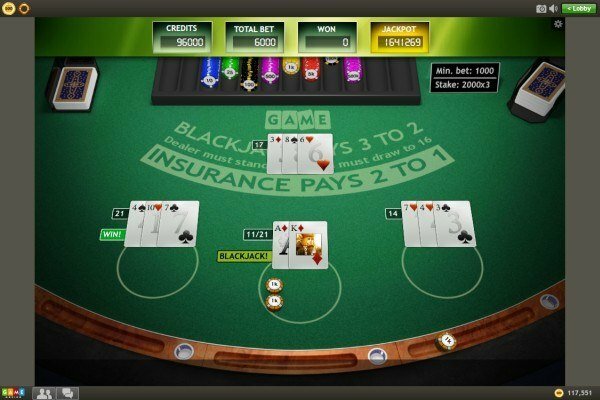 The insurance value is half the bet (for example, when the bet is 100 GameChips, the insurance is 50 GameChips). Insurance protects the player in case the dealer hits a blackjack. More specifically, if the dealer's second card is a Ten, Jack, Queen or King. Surrender – if a player thinks that he will not have a better hand than the dealer has, there is an option of surrendering the hand by clicking the red “SURRENDER” button at the bottom, on the left side of the command bar. In the event of a surrender, half of the GameChips that where bet return to the player. Buyin X – in the bottom left corner there is a big red chip with the text “buyin” written on it. After clicking on this chip, amount of X GameChips will be transferred form the player's account to the table. Split – when the player's first two cards have an equal number of points (for example, two matching cards or a Ten with any face card) the player has the option, but is not obliged to, split their cards into two separate hands. The value of cards from 2 to 10 equals that of the card number (for example, a 7 of spades is worth 7 points). The value of a jack, queen and king card is 10. The value of an ace is equal to 1 or 11, depending on how it’s better used by the player (for example, if a player is dealt a 2, 4, 3 and an ace, the total can be either 10 or 20 points). 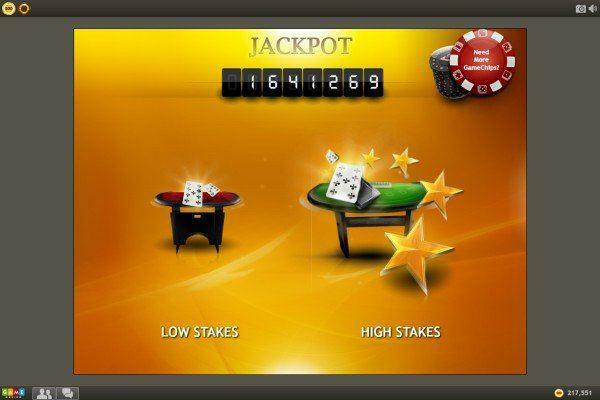 The Jackpot is awarded to a player having an 8 card set with a sum less or equal to 21.